Avian influenza (‘bird flu’) has again made us aware of the scientific research which underpins government policy. Some have great faith in this science, others have none. Our growing understandings of how scientific research and public policy inter-relate can however help inform both science itself, and how political / policy decisions might be taken in real life has provoked quite a debate in The Guardian about how science and politics inter-relate. Recent contributors to this debate include Erik Millstone and Simon Jenkins, who are right to raise the issue of scientific adviceto the Government in respect of avian influenza – just as Ministers are right to take this advice seriously. But in reality there is no such thing as ‘pure’ scientific research. All research, whether ‘natural’ or ‘social’, is predicated on often taken-for-granted understandings of context. However inadvertently, therefore, the gap between scientific advice and policy / politic, whether in the case of avian influenza or any other issue, is wide not as Prof Millstone and Mr Jenkins might in different ways seem to suggest. Scientific advice arises from scientific research questions, and scientific research tends to be structured largely around ‘received’ understandings of the issues involved – including, inevitably, contexts of those issues. In other words, natural scientists, as non-experts in matters socio-economic, will tend, if unchallenged, towards uncritical acceptance of the status quo or predominant contextual view of the situation in the same way as any other ‘person in the street’. It is not surprising therefore that science, in selecting which techno-scientific issues to address, has in the past often focused on the interests of the most collectively powerful and visible operators. This is now changing as questions about socio-economic impact are, rightly, articulated more loudly. It is encouraging that Government politicians and policy-makers are beginning to recognise the critical importance of framing scientific research, from its inception, around contextual as well as ‘purely’ scientific questions. 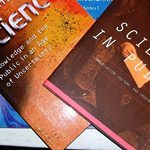 Articulating these wider understandings better from the inception of any piece of research is the way to ensure that scientific advice can best inform political decision-making. And doing this certainly does not diminish the robustness of scientific endeavour; rather the converse. The selection of ways forward in policy is ultimately a political responsibility; but making sure that ‘scientific’ questions acknowledge the whole spectrum of contextual interests is a responsibility which, thankfully, scientists advising decision-makers are themselves increasingly aware that they must share. A version of this posting was published on The Guardian letters page of 17 February 2007. We help nearly 400 individuals who come to us puzzled and shocked because they have started to react with ill health symptoms to ordinary electrical fields as electromagnetic radiation, EMR, in their home and office environment. None of them expected it and certainly do not want it. It could be you. Try as they may only a few GPs recognise the cause as low level electromagnetic radiation interfering with the workings of the body. We now know this is via EMR damaging the phospholipid membrane of cells with pulsing signals. This prevents cells from communicating and operating the immune system as Dr George Carlo who ran the 25 million dollar US Safety Research Programme for five years told MPs and public at Portcullis House last February 22nd. Scientific advice to our government however has raised the bar so high against accepting this can happen to a minority of sensitive individuals there is no proper research into causation and treatment. They are abandoned by the state without succour and even ridiculed, read their ‘personal stories’ on our website at http://www.electrosensitivity.org.uk. This is a consequence of the contextual pressures Hilary Burrage clarifies, especially around the ‘critical importance of framing scientific research, from its inception around contextual as well as ‘purely’ scientific questions’. We now claim to have the first ‘politically incorrect illness’.